Death Valley offers some of the strangest scenery anywhere as well as North America's lowest and hottest place. 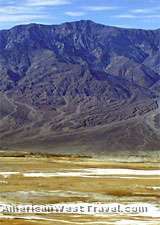 Besides the colorful, sculpted desert hills, sand dunes, and salt flats, spectacular mountains dominate the backdrop. The snow-covered Sierra Nevada with the tallest peaks in the lower 48 states are visible along the route. 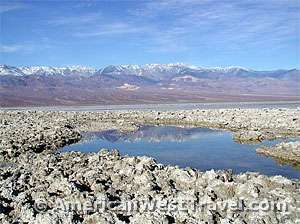 The colorful scenery at Death Valley is due to the presence of many minerals. The most fantastic example can be seen on the road to Badwater. Take a side trip on Artist Drive to Artist Palette. Here the rock formations are tinted in hues of pink, lavender, blue, red and green. At Golden Canyon, gold-hued Manly Beacon contrasts with thegenerally deep blue sky. Evidence of mining and old mining towns are common throughout the region. Notable examples include the ghost towns of Rhyolite and Skidoo, the Eureka Mine, and the Charcoal Kilns. A can't-miss attraction is Scotty's Castle, 25 miles to the north. The huge and opulent mansion with its man-made oasis is a bit surreal in this stark desert. It was built by Death Vally Scotty, the region's most legendary and flamboyant character, during the early 20th century. Now part of the national park, the mansion is preserved as it was in 1939, and rangers offer daily tours. 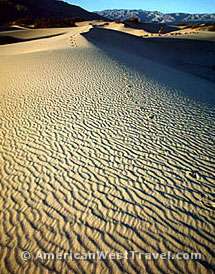 Death Valley National Park is an easy two hour drive from Las Vegas. The weather is perfect for visitation during the winter. During the summer, it is one of the world's hottest places with temperatures sometimes exceeding 120°F (49°C). Some features on this map can be clicked on to view further information.